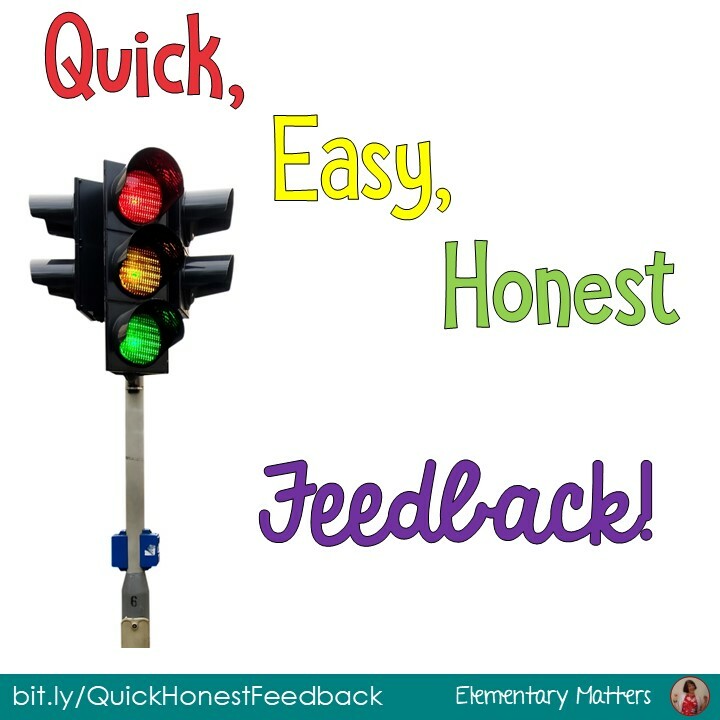 Elementary Matters: Quick, Easy, and Honest Feedback! 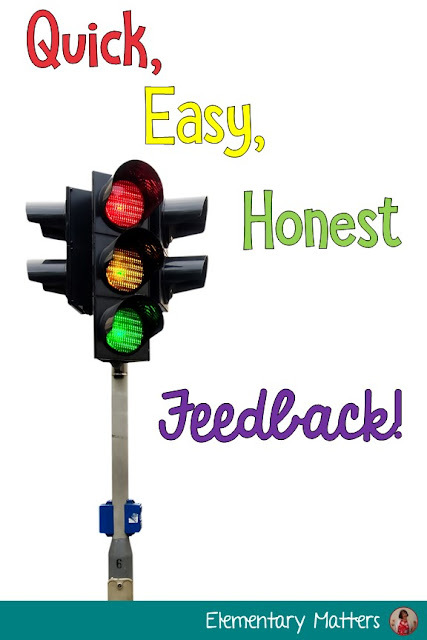 Brain research tells us that honest feedback is essential in order for learning to happen. Common sense also tells us that children need to know if they're on track. I make a point to give honest feedback whenever I can. 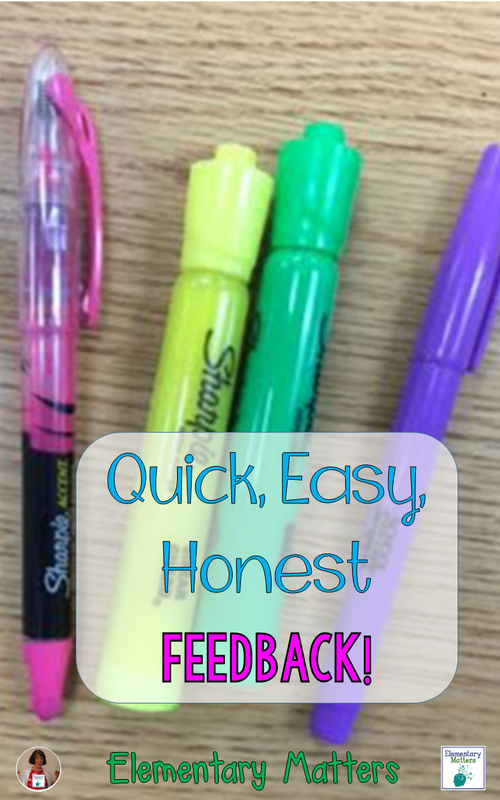 On written work, I use 4 highlighters: red (or pink), yellow, green, and purple. If I highlight the child's name in green, that means they're doing just what's expected, they're right on track! 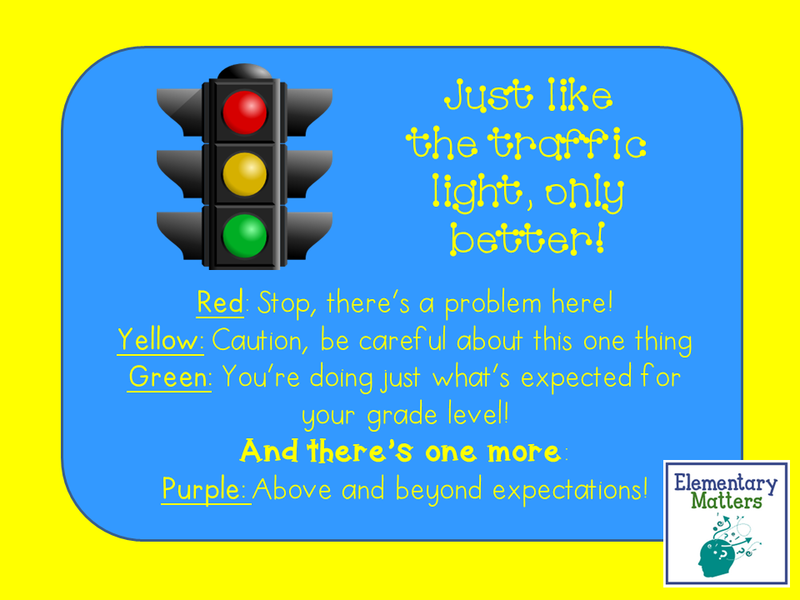 But there's one more: if a child's name is highlighted in purple, that means his work is above and beyond expectations. Purple represents royalty, so I'll often bow to these children! For most papers, like homework, the only mark I make is the highlight at the top of the paper. Sometimes I'll focus on a specific skill, and make a note and highlight about that topic or skill. 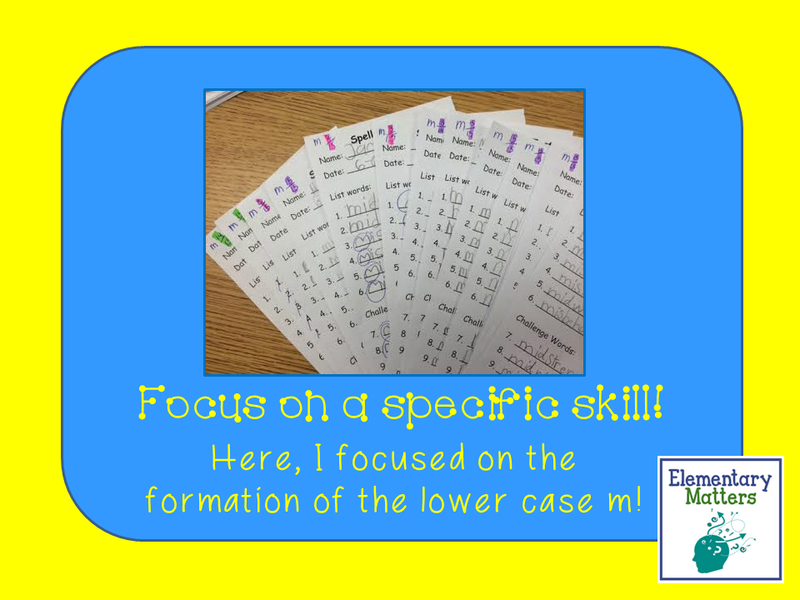 In the spelling papers below, I focused on the correct formation of the lower case m.
Then, of course, I'll find a little something spectacular that a child has done, and I'll make a point to make a purple star right on that part of the paper. I often hold up these papers for the children to see. The next day, many children are doing the same thing on their papers. It's amazing how happy it makes the children to get a little positive attention! 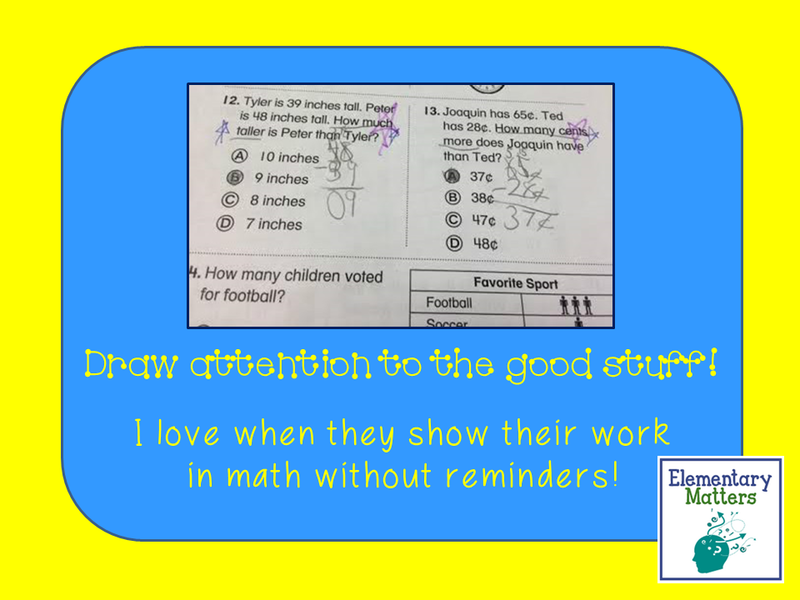 On the paper below, I've made purple stars for children showing their work in math. Well, there you go! It's easy to remember. It cuts back on my correcting time AND it gives the children the honest feedback they need! 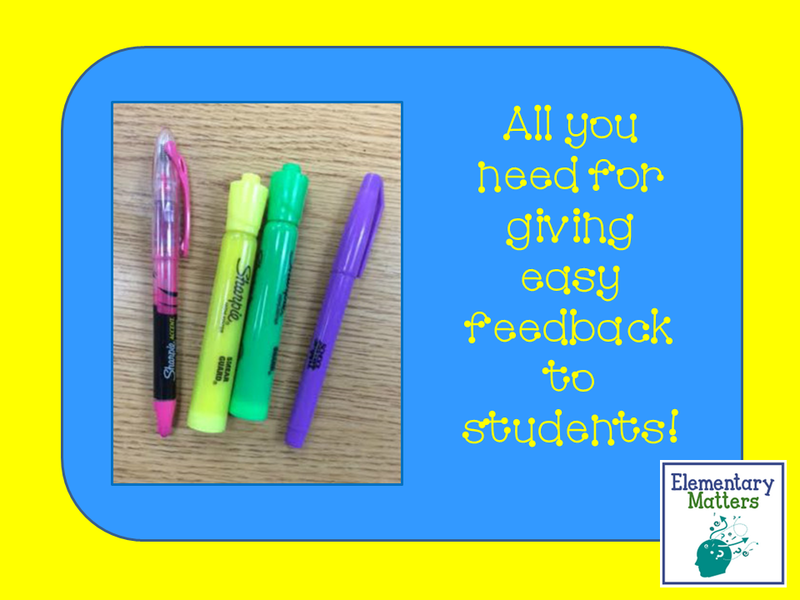 I hope you find this bright idea helpful! If you like this idea, please consider following me on Facebook, Pinterest, or Twitter for more great ideas! This is a fabulous idea!!!! Thank you! Children love to be recognized for their hard work! I am sure the students get very excited to see that purple on their papers! That really is a BRIGHT Idea! I love it! Thanks for sharing it. I love this idea! Simple, quick, and efficient.